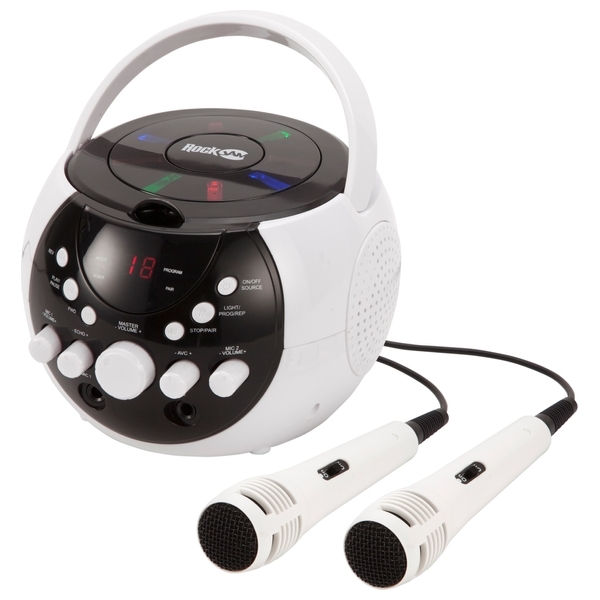 Contains 1 x RockJam Karaoke Machine, 2 x Microphones, A/V Cable, RCA Type, DC Adapter, 2 x 16 Song Chart Hits CD+G discs, Comprehensive User Guide. Bluetooth music playback from your phone or tablet. Flashing LED lightshow on top of the karaoke machine create a disco effect. Automatic voice control - replaces the original singers voice with yours when playing a karaoke CD+G. Echo control -adds depth and resonance to the sound of your voice. 2 digit red LED display. Get the karaoke party started with the fantastic RockJam Karaoke Party Pack (RJ0882BT). Contains two microphones and also includes 2 x karaoke CD+G discs packed with fantastic chart hits so you and a friend can sing along to your favourite artist. Bluetooth functionality for playback of your favourite music from phones and tablets. Can also play CD’s for use all year round. Multi-coloured LED lightshow around the top of the machine enhance your performance turning it into a full-on sound and light spectacle. 9 different lightshow modes in total. Lightshow can be switched off if required. Use the included AV cable (RCA type) to view CD+G lyrics and graphics on your TV. The Automatic Voice Control (AVC) and Echo Control add even more functions for you to enjoy.